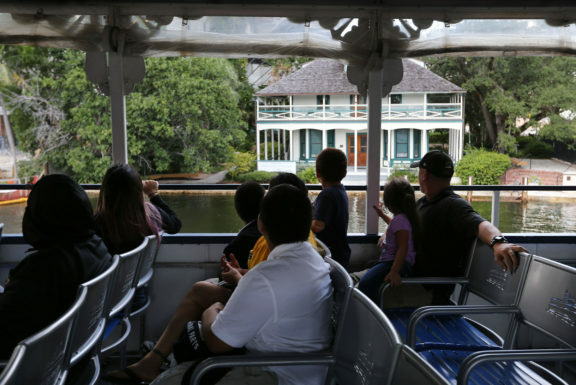 Tribal citizens aboard the Jungle Queen riverboat Oct. 11 view the Stranahan House while motoring up the New River on the way to a dinner and a show at a location where Seminoles sold crafts and wrestled alligators for tourists during the 1930s through about the late 1980s. The event, organized by Hollywood Board Rep. Steve Osceola, was held for seniors and their families. FORT LAUDERDALE — When more than 60 seniors and their families cruised up the New River on a recent Tuesday evening, they landed on an oak hammock close in distance but far from the world they live in now. The “island” was a trading post for their parents and grandparents from the mid-1930s through around the late 1980s — sort of. It was a tourist destination owned by white entrepreneur Al Starts, only accessible via a guided boat ride that would bring hundreds of wealthy vacationers to see Seminole Indians wrestle alligators and make and sell crafts. 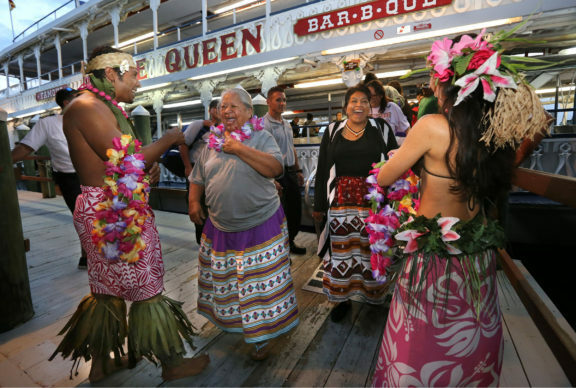 Juanita Osceola is greeted by Polynesian dancers who provided guests with colorful leis during a cruise on the Jungle Queen riverboat Oct. 11 in Fort Lauderdale. 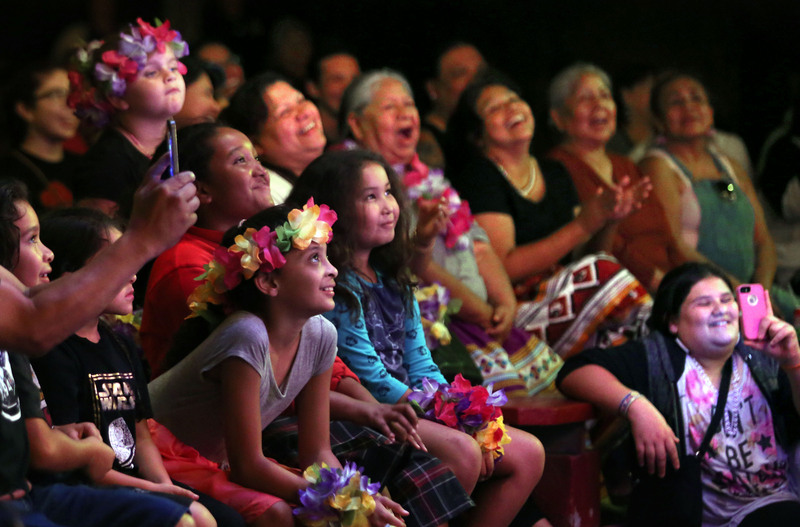 Seminoles gathered for an evening of entertainment, stories and memories. “A lot of our people grew up here. They remember this as ‘the Indian village.’ Tonight we’re going to look at it with a different lens,” said Hollywood Board Rep. Steve Osceola, who organized the night of memories and fun Oct. 11 that began aboard the famous Fort Lauderdale-based Jungle Queen riverboat. Many of the guests thumbed through a book of black and white photographs before the boat left the dock at the Bahia Mar Yachting Center. The photos were all of family members — men, women and children dressed in patchwork doing what tourists expected: wresting gators and selling crafts. Hardly any of the people were identified by name. When they arrived on the island, this time as paying guests at the lush tropical hideaway surrounded by wetlands, they were greeted by Polynesian dancers who adorned them in colorful leis. Once inside, they feasted on a lavish barbecue dinner while listening to a jazz trio belt out classic hits. 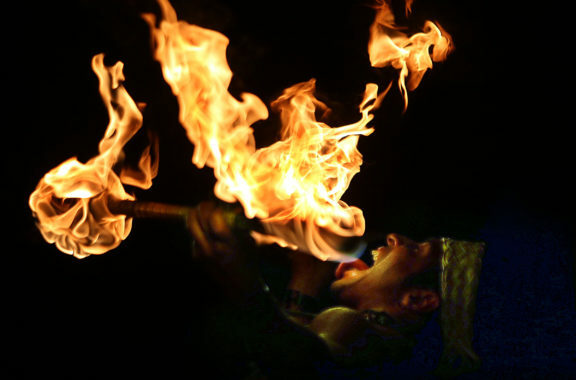 Afterward, a comedian, magician, ventriloquist and several fire dancers provoked the packed house into laughter and applause. 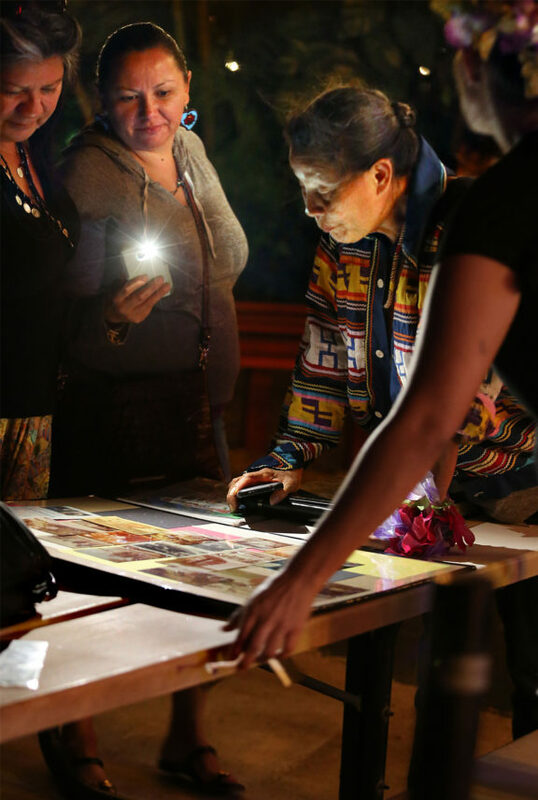 For likely the first time in nearly 80 years, a community of Seminole Tribe citizens that ranged from babies to elders gathered at the scene and were not part of the attraction. “I grew up here under tourism. We’d come up on the river, there was woods everywhere, and we’d follow the boats. Everywhere the boats went, we went to sell. The old wresters made their way here, too. 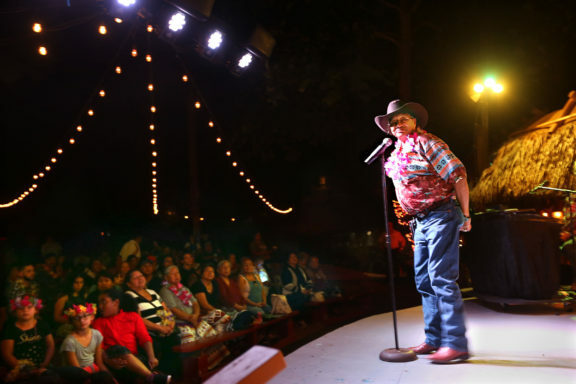 That’s what we did,” Moses Jumper Jr. said when he, Rep. Osceola and President Mitchell Cypress took the stage to address the crowd before showtime. Rep. Osceola remembered hearing stories about the tourist days when families did what they could to make money and take care of each other. He recalled seeing photos of his uncles wrestling alligators, women making crafts and children posing for pictures. “These days our kids just have to ask for something and they get what they want. Back then, they just had a bucket or a can so when tourist took a picture of them they could collect a nickel,” Osceola said. The Jungle Queen sightseeing river tour and Indian village destination was launched by Starts in 1935. After World War II, he added a dinner cruise component. Later, the cruise included moonlit tropical island shows. In 1958, former vaudeville showman Earl Farber purchased the place and added outdoor entertainment areas. His son Jerry Farber took over in 1963 and expanded the business to include the 500-seat sternwheeler vessel and a bar. Today, the family business is run by Todd and Mike Farber and includes animal displays and critter shows, a gift shop, and several stages. Since the beginning, the entertainment ground has included Seminole-built chickees and some buildings topped with chickee-thatched roofs. Donna McCarthy, the company’s vice president of operations, said Seminole vendors were still selling dolls and jewelry there in the early1990s but they stopped coming regularly about a dozen years ago. None of the current alligator wrestlers are known to be Tribe citizens. Still, the website boasts 48 old-time photos with some of Seminoles and many framed photos with Tribe members dot the establishment’s walls. A small historical section planned as the next addition will include the Seminole connection. Tribal citizens, young and young at heart, laugh heartily at the antics of a comedic magician during a night out Oct. 11 in Fort Lauderdale that featured a cruise up the New River aboard the Jungle Queen riverboat plus dinner and a show at the tourist attraction’s oak hammock “island” steeped in Seminole memories. While chatting with Mike Farber during the event, Jumper was asked if he knew one of the famous alligator wrestlers from the old days named Chief Willie Jumper. Moses Jumper answered no, but when he looked at a photo of the supposed chief, he recognized his own father, Moses Jumper Sr. who apparently had been accidently misidentified by Jungle Queen staff for years. Other Seminole alligator wresters who worked there included Ronnie Doctor and James E. Billie. “We just can’t tell our story without the Seminoles. We’re in our history books together,” McCarthy said. But some of that history is comfortably left behind for some Tribal members who remember those days as difficult times. On the return cruise from the night of dining and entertainment, several of the seniors shared their thoughts. Rosetta Jumper Rhodd said she sung at the Indian village when she was a little girl. She called it “going to boats.” The children would line up on the dock and sing “Jesus Loves Me” in Mikasuki then recite the Pledge of Allegiance. Judy Bill Osceola also recalled singing “Jesus Loves Me” for tourists. “I remember all the white people would come and give me money but I didn’t know what I was singing. I didn’t even know who Jesus was. But I know now that He brought us this far. We were so poor but still my dad prayed at dinner and he thanked God for what we had,” Osceola said. Janice Osceola remembered vividly how the elders struggled. Her father parked cars for a living, though he couldn’t afford his own car. Those were days when Seminoles were not welcome in the “white people store,” so her father went to the “blacks only store” where one day, an African-American man felt sorry for him and drove him home. “Other times we had to go behind Publix for groceries they couldn’t sell. We’d pick through lettuce and peel back the leaves to get to the part that was still good. Those days, we had to know how to hunt, fish and build things. 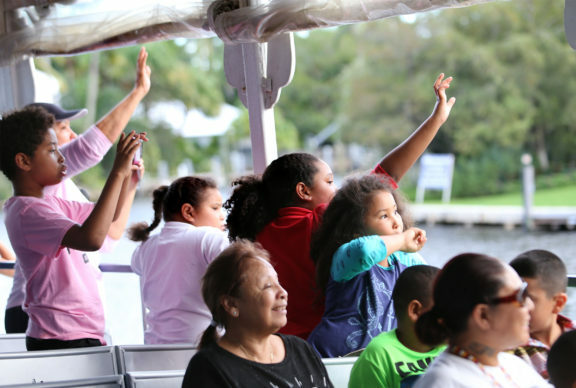 And we’d ‘go to boats’ to make beadwork and sing to get money,” Janice Osceola said. Even though the memories conjured by the night on the island were mostly borne out of struggle, no one spoke angrily. 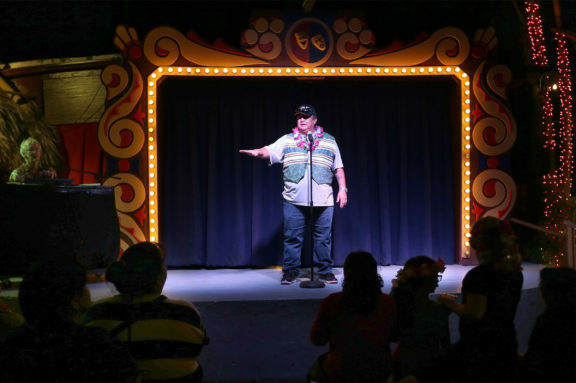 Hollywood Board Rep. Steve Osceola opens a variety of show at the oak hammock dinner and entertainment center during the Oct. 11 Jungle Queen riverboat cruise on the New River. Seminole Tribe of Florida, Inc. Board President Mitchell Cypress greets the audience aboard the Jungle Queen riverboat Oct. 11. 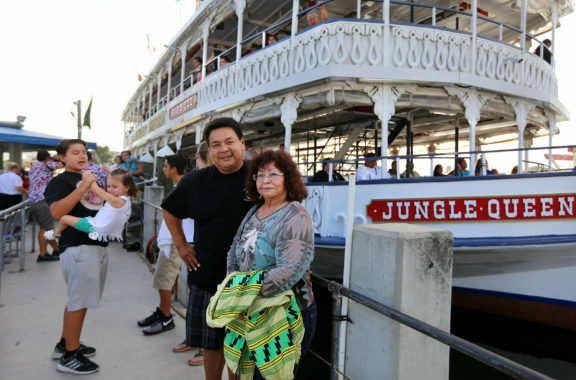 Mitch Osceola and Polly Hayes get ready to board the Jungle Queen riverboat Oct. 11 in Fort Lauderdale.